I was recently privileged to participate in a WSET (Wine, Spirit, & Education Trust) Level 2 course here in Israel. Ten years ago, I knew nothing about wine, and since coming to Israel for the first time, I have slowly begun building my knowledge about grapes, wine and vineyards. When I started the WSET Level 2 course, though, I quickly realized that my level of knowledge in this area was miniscule. WSET is a UK-based school of learning that is internationally recognized for training sommeliers and wine experts. 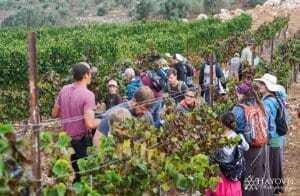 Some of you may be familiar with the presentation “Israel’s Story Told Through Wines” that Caleb Waller has recently been taking throughout North America, along with wine tastings for Israeli wines. Over the five weeks of the course, I began to have a revelation about the wine industry around the world, and the recent comeback of wines here in the land of Israel. I hope you’ll find this idea as fascinating as I did. When discussing world wines, the terms “old world” and “new world” are used to describe the well-known regions around the world. Most of Europe is considered old world, with France generally being cited as the top region for many wine varieties. Places like North America and Australia are generally considered new world regions. Israel is not even mentioned in the course, being too small and new to the wine stage. High quality wines from old world regions are many times known by their geographical location, and not necessarily their wineries. In French, there is no word for “winery,” and many high quality wines are labeled according to their region, village, or family vineyard. For instance, if you see a wine labeled “Chablis,” you know that this particular wine will be a very high quality Chardonnay, and will come from the region of Chablis, France. A “Pouilly Fume” labeled wine must be from 100% Sauvignon Blanc grapes and come from the region of Bourgogne, France. New world wines sometimes depend on the winemaking process for the reputation and quality of their wine. Wineries are often more famous than the vineyard where the grapes come from. Typically, when speaking of high quality wines, old world wines are considered to be some of the finest in the world. Thirty years ago, there were no vineyards in Samaria. Even though the entire region of Judea and Samaria is dotted with ancient cisterns, wine and olive oil presses cut into the rocks, and even wine aging caves; until the early 1990’s, grapes were not grown here. In Samaria alone, there have been more than 300 ancient wine presses discovered! Because of the archaeology, and the permanent reminders engraved into the rocks on these hills, we know what once was – that Israel was a major competitor in the world for the wine industry 2,000 years ago. Because Samaria is just north of Jerusalem, and Judea south, we can also judge that much of the wine made in these hills would have been used in the offerings in the Temple, and would therefore have been some of the finest in the world. However, after the destruction of the Temple, these hills in the heartland of Israel lay desolate for 2,000 years. Even after the rebirth of the State of Israel in 1948, for nearly 50 more years, hardly anything was grown here. Then in the early 90s, a few brave farmers decided that what the prophets once spoke must come to literal fruition. Against the advice of the agricultural experts, farmers began to plant. On the Mount of Blessing, several brave farmers planted a few acres of wine grapes in 1997. Just a few short years later, their first harvest came in. They managed to secure a contract with Carmel Winery – the largest winery in Israel – to buy their grapes, as they had not yet started making wine themselves. The story goes that when the very small harvest of grapes reached Carmel that year, they immediately realized that these grapes were of a higher quality than their usual purchases, and they decided to separate them and make a wine with just the grapes from the Mount of Blessing. Since then, grapes coming from the Mount of Blessing are considered a very high quality, and are sought after, all over Israel. Since that time, wineries and vineyards have sprouted and taken flight all over Jerusalem, Judea and Samaria. Wines from these regions have won an untold number of gold, silver, and bronze medals in national and international competitions, competing with wines from around the world in blind tastings. The prophecy of Amos is truly coming to pass. As I went through the WSET Level 2 course, I realized that Israel is so new on the wine stage, that they’re not even referenced in the traditional material. If they are mentioned at all, it is in the context of “new world” wines. After pondering the history of winemaking here, and the phenomenon of so many vineyards and wineries cropping up and taking their place amongst world-renowned wines, I realized that it is only a matter of time before Israel is restored to its rightful place as an old world wine region, and referenced as some of the highest quality wine in the world. World-renowned wines were made here 2,000 years ago – the evidence is etched into the rocks on these hills. In less than 30 years, the vineyards and wineries have grown by an exponential number, and the wines that are winning international medals in blind competitions have reached a staggering number. I’m looking forward to the day when labels like “Har Bracha” (Mount of Blessing), “Shiloh,” “Psagot,” and “Mountains of Judea” will be known as specific, famous wines all around the world, with reputations to match. If Amos’ prophecy comes to complete fruition, then this time is not too far away. It’s all part of the greater restoration of God’s Kingdom happening here in the land of Israel, and we can all be a part of it.